Dr Chris Child, Director of City’s MSc in Computer Games Technology, comments on the spectacular growth of organised video game competitions. 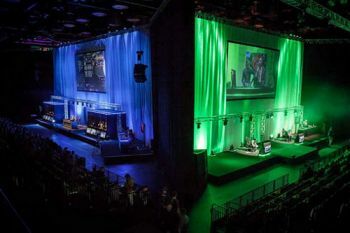 eSports, or organised multiplayer video game competitions, are taking the gaming world by storm. Bolstered by the popularity of streaming services such as MLG and Twitch, enthusiasts and competitors around the world can now connect with each other by playing and watching games such as Quake, Street Fighter, Counter-Strike and League of Legends. At an annual rate of £25bn, South Korea leads the table for earnings from eSports, followed by the USA, China and Sweden. Such is the popularity of organised multiplayer gaming in the UK that a brand new 600-seat eSports arena - the Gfinity Arena - will be completed in Fulham, West London, at the end of March. Last year saw G3, the UK’s biggest eSports event, with 4000 spectators descending on the Copperbox Arena in Stratford Olympic Park. The top eSports gaming champion of 2014, Peoples Republic of China’s Jiao Wang (a.k.a ‘Banana’) finished the year with £740,000 in earnings from competitions. Viewership across all eSports titles has doubled in recent years, according to a recent study carried out by Super Data Research. The success of each eSports event hinges on attracting large teams to play which in turn creates huge financial incentives for top players. These teams also drive advertising revenue and increased viewer numbers. With eSports attracting massive amounts of money in comparison to other sporting disciplines, the incidence of cheating players is of concern to regulators of multiplayer video game competitions. This is where City has a role to play. Director of the University’s MSc in Computer Games Technology, Dr Chris Child, says he and his students are making a contribution to the development of eSports, specifically in match-fixing prevention technology: “My students are contributing to eSports by providing enabling technologies both in game development and supporting systems. Does Dr Child believe eSports have the potential to become an Olympic sport? With greater levels of internet connectivity and broadband bandwidth, it is clear that eSports will continue to show rapid development and popularity in the years ahead. Multiplayer is a mode of play for computer and video games where two or more gamers can play in the same game at the same time, co-operatively as a clan (or team) or head-to-head competitively (often referred to as a deathmatch). Multiplayer mode may be a split screen where the gamers play at the same time on one system, or where gamers play on separate systems connected to an Internet game server.